It’s day four and when I wake up this morning my thoughts are flooded with happiness and pride in knowing this – I have survived three full days on the trail! I did not sleep much the night before in the swampy bog that was our camp site, but this has been our last evening of tarp camping and this brings me much comfort. For the rest of the hike our accommodation will be homestays. We will be staying in the homes of four local families in Piedras Blancas, a small village of seven families in the region. 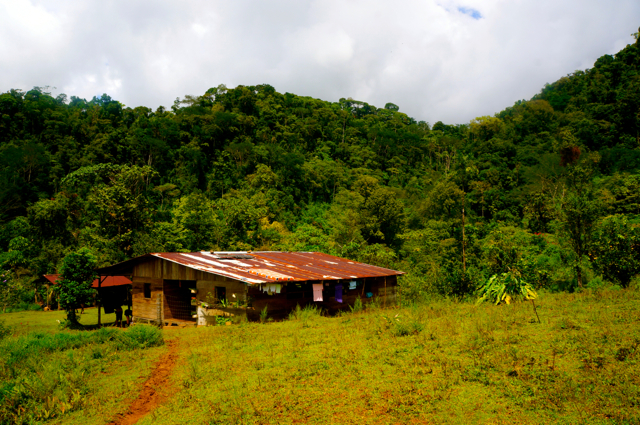 The trail we have been hiking was constructed by three brothers, one of whom still lives in this village. Today’s hike is much shorter than yesterday’s, but it does not feel short as the trail is downhill 100 percent of the journey, steep and, again, covered in mud. I slip too many times to count and my shorts are covered in layers of mud. I’ve given up any attempts at keeping clean. 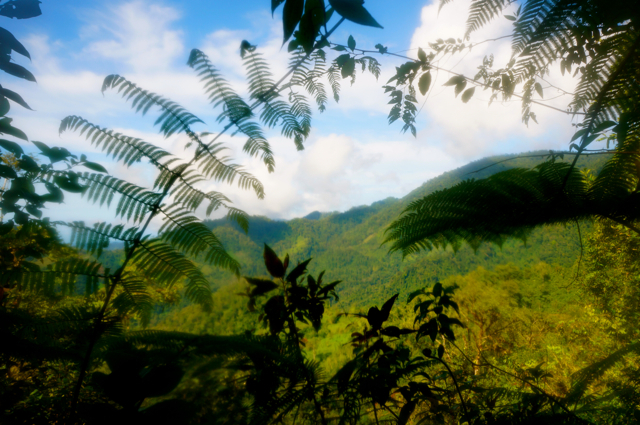 The trail opens wide, leading out of the rainforest and the sun beats down, hot on our backs. I realize how lucky we have been to have been hiking in the rainforest where it is cool and the dense foliage and fog protect from the sun. In the field we encounter a man using a machete for some purpose unclear to me. I realize it is the first non-group member we have seen in three plus days. Our instructors tell us the house is close, but their definition of close differs greatly from mine and so, corner after corner brings me disappointment as the trail reveals only more steep curves and mud. At last the house comes into view in a clearing in a field below. Upon seeing our final destination for the day, the full weight of my pack and fatigue weighs in and I slow down. The house belongs to a woman named Magda and see greets us. Her daughter-in-law sits on the front door step bouncing a baby wearing the cleanest white t-shirt I’ve ever seen. In her green skirt, head band and sandles, the baby is the opposite of our hiking group – drenched in sweat and mud, exhausted. 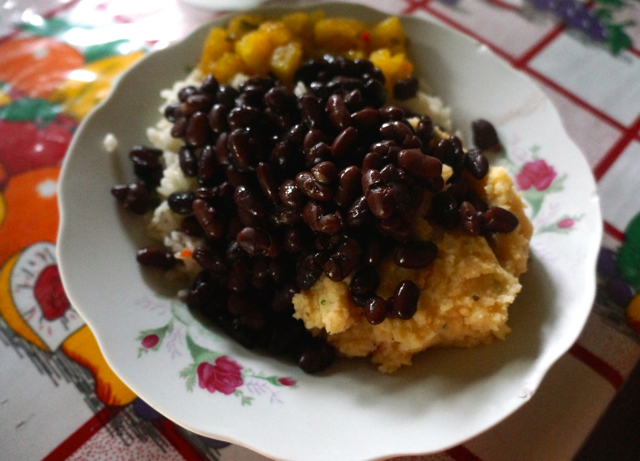 We take showers and Magda cooks us a typical “tico meal” of rice, beans, chayote (squash) and mashed potatoes. The day passes quickly. I am so content to be clean, well-fed and under a roof, that not much matters. 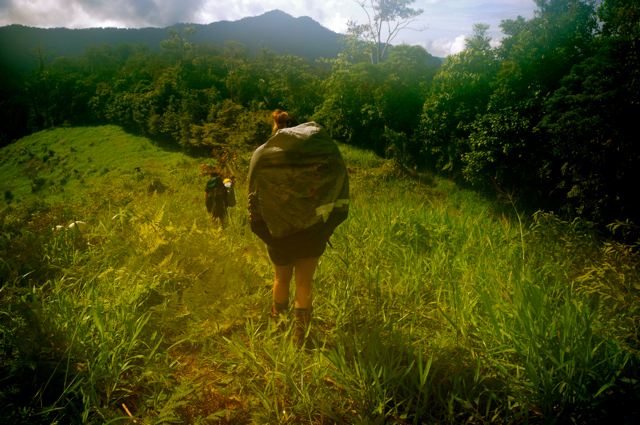 On day five the students I am hiking with spend 24-hours doing a “solo” (a reflection alone in the rainforest with minimal supplies) and I stay at the house, washing my clothes and equipment by hand, eating Magda’s food, playing with baby Kimbra and doing some reflection of my own. Actual time spent hiking: 2 hours, 30 minutes. 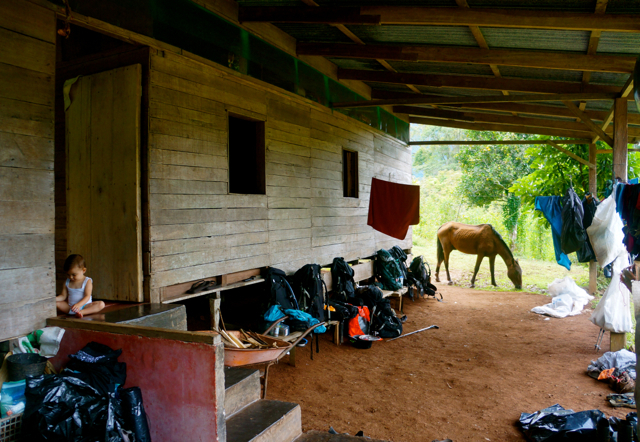 *Note: This post is the fourth in a series of an account of my experiences during a ten-day hike with Outward Bound Costa Rica, leading through varied landscapes and small pueblos in Costa Rica’s Central Valley. During the trek we camped under tarps and stayed with local families for a culture exchange. I hiked with seven students and two instructors, however, out of respect for my fellow participants will not mention their names or stories in this series, but rather focus on my own journey of self-discovery along the trail. Read the rest of the series here.